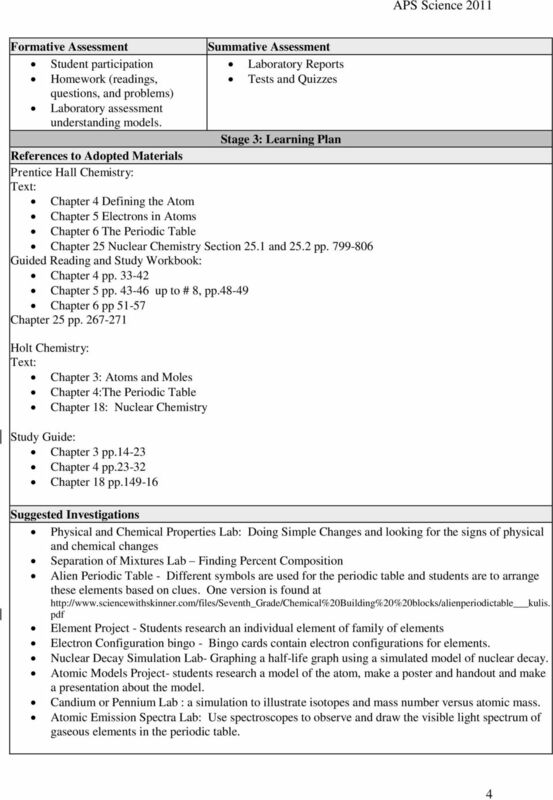 Download "APS Science Curriculum Unit Planner"
Unit 3 Review Chapters 4 (Atomic Structure) & 6 (Periodic Table) Part 1: Answer the following questions. 1. a. Which scientist created the first modern atomic theory? John Dalton b. What was his theory? Chemistry. The student will be able to identify and apply basic safety procedures and identify basic equipment. The idea of arranging the elements in the periodic table according to their chemical and physical properties is attributed to. d) Ramsay. Periodic Table Instructional Background Patterns in Element Properties (History): Elements vary widely in their properties, but in an orderly way. 9/13/2013. However, Dalton thought that an atom was just a tiny sphere with no internal parts. This is sometimes referred to as the cannonball model. Chapter 17 Assessment Please write you answers on a separate piece of paper. Table of Contents. 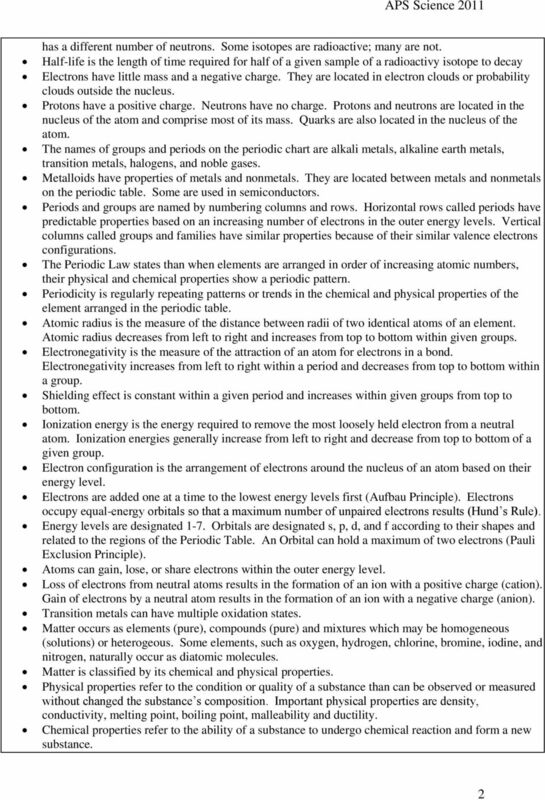 Chapter 4 Elements and the Periodic Table. Chapter Preview. 4.1 Introduction to Atoms. 4.2 Organizing the Elements. 4. Chapter 2: Atoms, Molecules and Ions The topics in this chapter should be review from a previous course. It is expected that you are able to review and master this material quickly and somewhat independently. Name: Class: Date:, ID: A The Periodic Table Multiple Choice Identify the choice that best completes the statement or answers the question: 1. What are the elements with atomic numbers from 58 to 71 called? 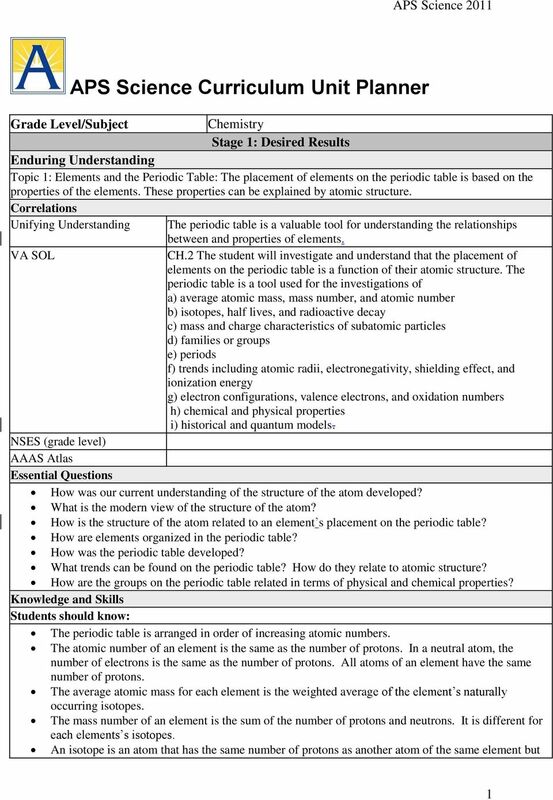 APS Science Curriculum Unit Planner Grade Level/Subject Chemistry Stage 1: Desired Results Enduring Understanding Topic 6 Solutions: Solutions concentrations can be understood by looking at molar relationships. Directions: Multiple Choice For each of the following questions, choose the answer that best answers the question and place it on your answer sheet. 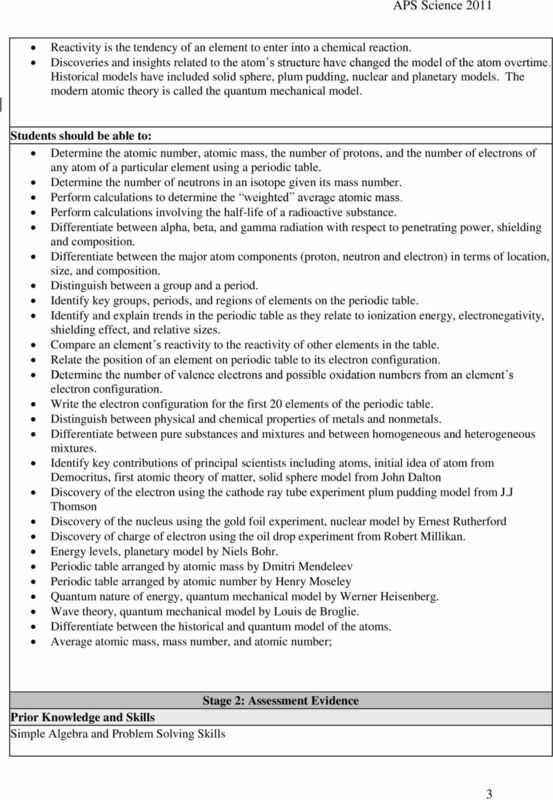 ATOMS A T O M S, I S O T O P E S, A N D I O N S The Academic Support Center @ Daytona State College (Science 120, Page 1 of 39) THE ATOM All elements listed on the periodic table are made up of atoms. 1 The Periodic Table Scientists had identified certain substances as elements and so there were many attempts to arrange the known elements so that there were some correlations between their known properties. The Periodic Table Organizing the Elements A few elements, such as gold and copper, have been known for thousands of years - since ancient times Yet, only about 13 had been identified by the year 1700. UNIT-3 Classification of elements and periodicity in properties One mark questions:. For the triad of elements A, B and C if the atomic weights of A and C are 7 and 39. Predict the atomic weight of B..
1301 TEST 1 REVIEW SHEET. You need to read chapters 1 through 4 All is fair game unless I announce otherwise on Wednesday before the test. Chapter Test. 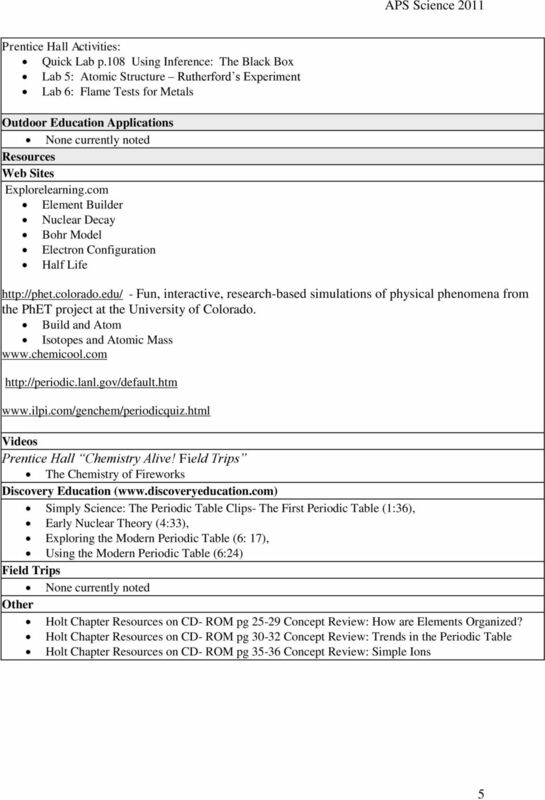 Teacher Notes and Answers 5 The Periodic Law TEST A 1. b 2. d 3. b 4. b 5. d 6. a 7. b 8. b 9. b 10. a 11. c 12. a.
Click: http://www.pbs.org/wgbh/nova/physics/hunting-elements.html Periodic Table: Organizes and classifying the elements Dmitri Mendeleev: Russian chemist who arranged according to their increasing atomic. 1) is credited with developing the concept of atomic numbers.